Ever have one of those days when you hoped things would go well, and then they just kept getting better and better? So much better that you thought you just might burst any minute? I had that today. 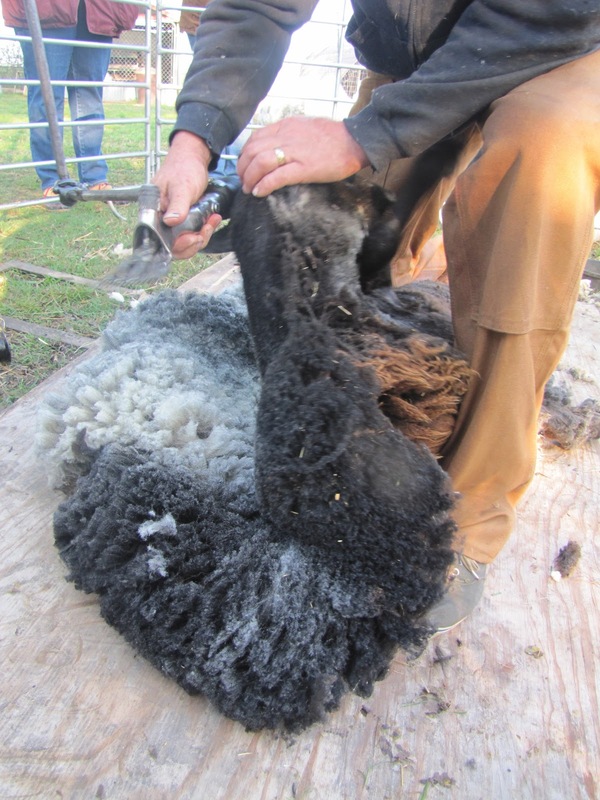 Shearing Day was phenomenal. The weather was gorgeous, the sheep cooperated, our shearer Danny did a bang-up job, the fleeces were 100 times better than I expected, a bunch of my favorite people showed up to share the day together, we met new friends, added two new shareholders to the fold, and we have a pregnant ewe. A Very Pregnant Ewe. South end of pregnant ewe. 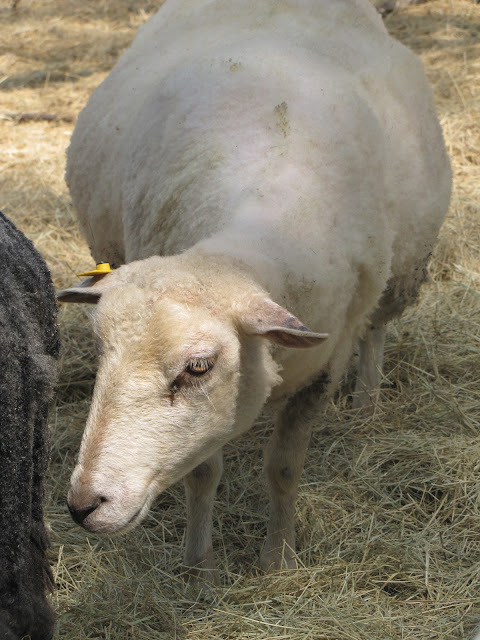 Mary Elizabeth seems to have fallen into the amorous embrace of one of the so-called wethers in the pasture -- sheep who were supposed to be neutered, but weren't. And by the looks of it, we could have a lamb or lambs pretty soon. I'm rolling my eyes at the unexpected turn of events, but inside, I'm giddy with delight. We've only had one lamb born here before, Shadrach, and he was a pip. Love the lambs. Please pray for a safe delivery for Mary Elizabeth. We raised her from a bottle baby, and she is a sweetheart. North end of pregnant ewe. Titus, a natural colored Gulf Coast sheep, gives up his fleece to the admiring gasps from the crowd. Yum. 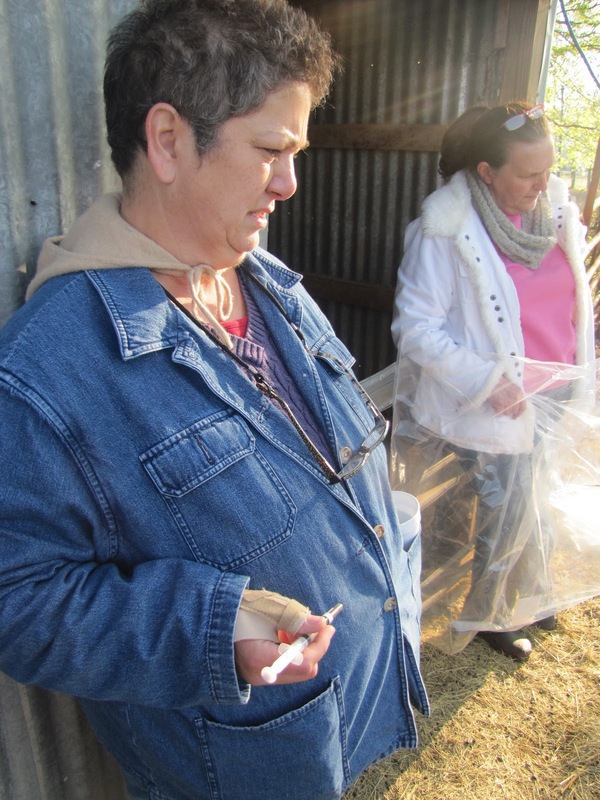 Nurse/farmhand Gail stands poised with the next CDT injection while Bag Lady Mary holds the next fleece bag ready. 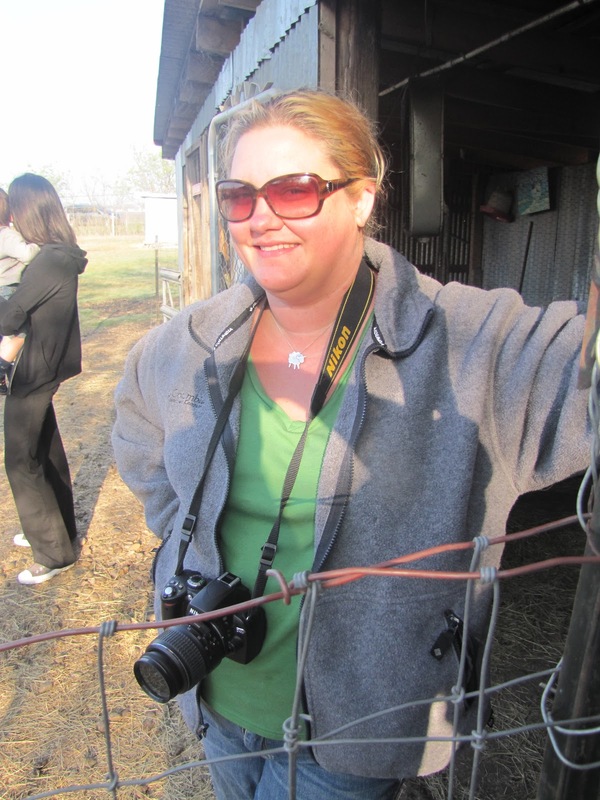 Future shepherd Leslie watches everything carefully - next year, this will be the sight at her Over the Moon Farm in Sachse, TX. We met lots of new friends day - kids watched something they may not get to see everyday. Pal Jennifer Jurek was on hand to take some incredible pictures. Go here to see them. Laying the fleeces out on the skirting table, we discovered that this year our sheep produced a huge bumper crop of lovely wool, both in white and natural browns and blacks. Oh. my. 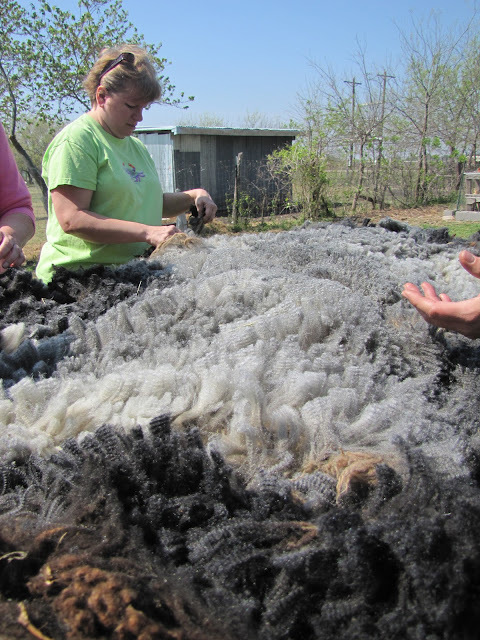 New friend Kristen, Mary, and Gail carefully pick through Samson's black and white Jacob fleece. 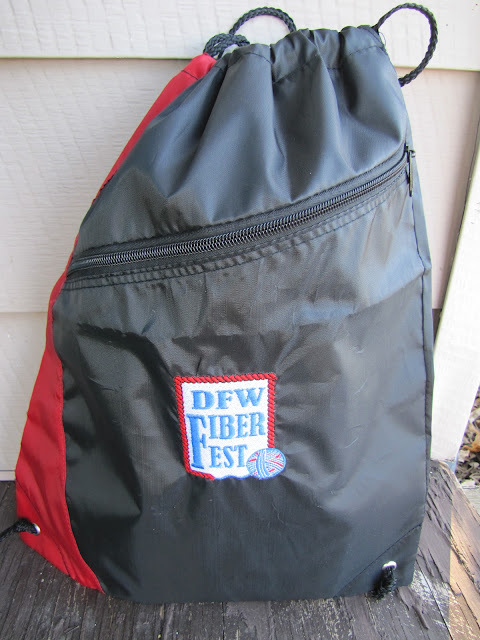 Rockstar podcaster Dawn, tried her hand at skirting Titus' fine, crimpy black and charcoal fleece. Shadrach looks no worse for the wear, and in fact, looks a bit relieved to be out of the wool coat before hot temperatures descend. Our little goofball Shetland, Phoebe, looks more like her peers now that she's nekkid. She's still kind of crazy, however. More of the flock can fit around the hay trough when they've been stripped of all that wool. 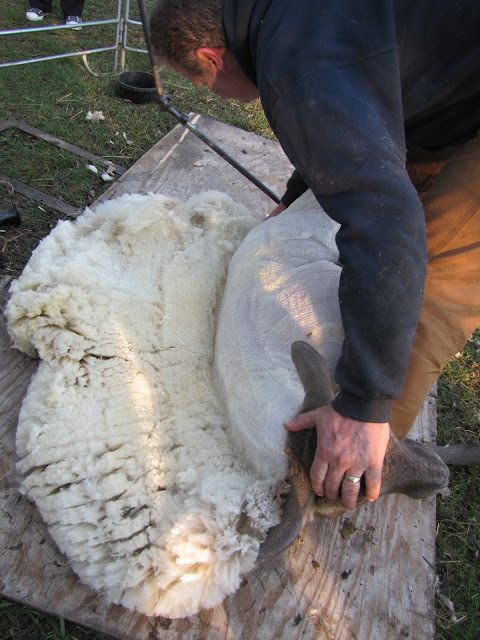 Isaiah, one of our yearling boys, sheared the biggest sheep fleece we've ever produced here at JRF - six pounds of the softest, crimpiest rough-skirted fleece you can imagine. It's not uniform - part of the fleece has tiny crimps, and the other part has large, beefy bundles of crimp. Let me know if you need to run your fingers through it before we start washing and cleaning up. You'll go weak in the knees. I'm so grateful for everyone who was a part of this special day - not only is the sheep shearing an important landmark as we travel through the CSA year, but the glorious outcome is just more evidence that our vibrant, growing community makes this farm what it is. You rock, little Flock. Is this the third time a so-called wether has turned out to be ram-ish? Makes me weak in the knees just looking at the fleeces... and (soon) a baby to boot!! That looks awesome! Congratulations on a great 'crop' AND a baby on the way... woo hoo! Ohhh, I love the fresh-cut side of a fleece. How glorious. Wow, what an incredible day! I remember when I used to write a lot when I was younger and if there was an absolutely amazing day, I can remember just not being able to capture it in words. I just wanted to bottle it up inside to keep the memory perfect! Sounds like you had one of those days. Thanks for sharing your sheep-y adventures!